Leading Manufacturer of shaking incubator from Thane. 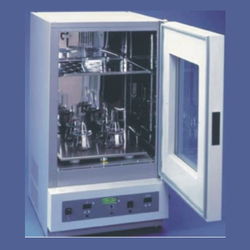 With the aid of our experienced professionals, we are engaged in manufacturing and supplying Shaking Incubator. These incubators are manufactured to deliver combined the advantage of storage temperatures with orbital shaking and controlled incubation. Also, to provide temperatures below ambient, hermetically sealed compressors are incorporated in the incubator shakers. While manufacturing these incubators, our professionals strictly follow the established guidelines of the industry at every stage.Stringently examined on different quality parameters before the final delivery.